An antisocial factory worker falls in love with a woman working in the neighboring factory. Too timid to do anything about it he basically just does nothing for much of the movie until he encounters this little alien bug looking thing. These aliens come to earth so they can inject themselves (graphically) into humans, which they use as vehicles to fight each other. It's like a fleshy version of Robot Jox! This movie wears its inspiration clearly on its sleeve. 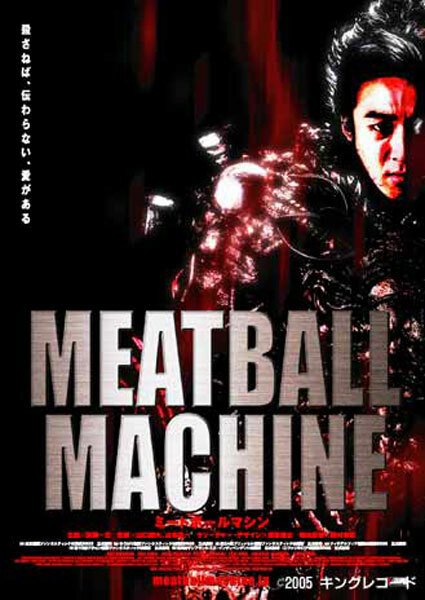 This is basically Tetsuo: The Iron Man in color with more blood. But it lacks a lot of the charm of that movie. Whereas Tetsuo is very vague and offers no explanations for anything, Meatball Machine is one of those movies where you have characters explaining everything to you at length. And it's also one of those movies where they will repeat dialog and key scenes for you in case you've forgotten what was just told to you 20 minutes ago. I guess what I mean to say is that there is a lot of padding in this movie. As a result, even at only 90 minutes this movie seems to run too long. It drags at times which is a huge problem in a movie that is supposed to be chaotic and violent and crazy. On top of the poor pacing, I couldn't find a single character I cared about. The "hero" sits there and is reduced to a sputtering blinking mess at the sight of any danger or conflict. There is a transvestite character in the movie who is pretty awesome though. I don't want to ruin it for you! But it's the best scene in the whole movie. So besides the transvestite, what is good about this movie? Well, I'll tell you. 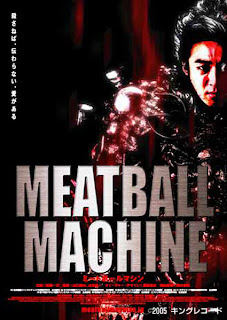 The special effects are pretty interesting, though they aren't as good as the (very) similar effects in Tetsuo (1988!). I don't remember a single CG effect, so if you appreciate good practical effects you might get a kick out of this. I really don't have a lot to say about this one. It was kind of boring. 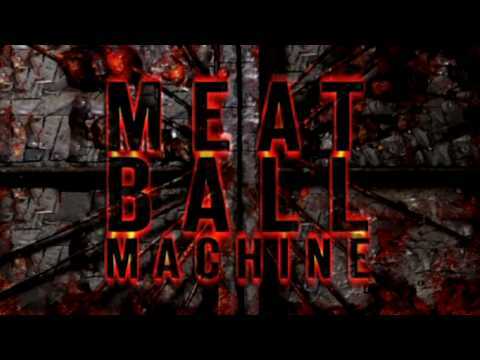 "Meatball Machine"? That sounds like something Mario would use to fire spicy, delicious projectiles at rampaging Goombas. You should watch the trailer for this!